Part one of our 2015 Report Cards and look towards next season. On the podcast this week we took a look at six clubs as end of season report cards naming up the Fantasy MVP, handing out a Coaches Award, giving a Rookie of the Year prize and naming up blokes who are, for various reasons, on our 2016 Watch List. The next six will be coming next week. Although he was the second highest averaging player from Geelong, Mark Blicavs wins the award for 2015. He finished the season with an average of 97 and rose $147,000 in total. He increased his average by 34pts this year and sat just behind Joel Selwood (avg. 98) on the leader board but gets the final tick of approval after a stellar season that saw him be one the most improved player in the AFL. Corey Enright equaled his best Fantasy season ever this year with a final average of 91. He played 21 games and actually sits ranked #3 for the season off the list of original defenders we had available from the start of the year. With an average of only 56, Jake Kolodjashnij gets the nod here. He played 9 games and increased by $171,000 from his starting price. Although he never set the scored board on fire, he did provide a valuable heart beat on the bench of many Fantasy teams this year. 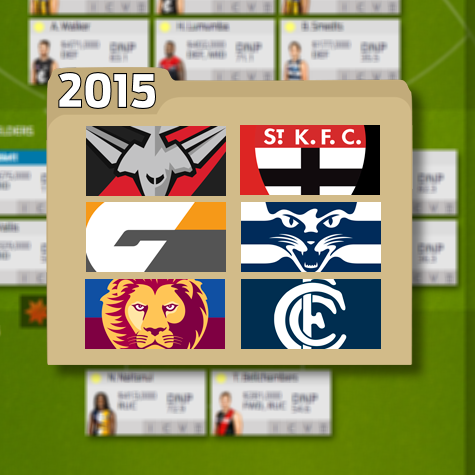 In 2016, there will be many Fantasy options coming from the Geelong list. With so many superstars hitting the road, plenty of opportunities will arise for many. Josh Caddy has averaged 63, 69 and 90 over his last three seasons there and could take the next step to be a premium midfielder next year, along with Cam Guthrie. He has averaged 55, 74 and 85 over his last three years and came home like a steam train in 2015, averaging 112 in his last 6 games. Daniel Menzel shone in his first game this year with 93pts but was then put on ice in his second game (21pts and vested). Therefore, he averaged just 57 from his two runs and will be so much better next year, but more importantly…. cheap. Finally, I have Mitch Duncan. He averaged 95 last year and due to injuries he only managed 11 games this year for an average of 80. Ink him into your 2016 team right now. With all their stars gone, Mitch Duncan will be the man of the future, and as long as Joel Selwood is still there, he’ll be off the radar for most taggers. Tough choice here with Sam Jacobs, Eddie Betts, Mitch Robinson, Jarrod Waite and Jeff Garlett coming off impressive years… Oh yeah, that’s right. So, on to the rest. The skipper Marc Murphy takes home the MVP after a strong second half of the season that bumped his average up to 98.3 for the season after scoring just one ton in the first six weeks. Murphy managed to reach triple figures on seven occasions after round ten, including impressive tallies of 117, 122, 128 and 139 in that time. After making his long awaited return in round ten, Matthew Kreuzer did a sensational job considering the circumstances, going on to average 83.1 from his 13 games. He increased $186,ooo with eight scores of 80 or over which leaves him on the radar next season. He managed three tons with 107, 109 and 110 which would suggest he will be under-priced in 2016 based on his ceiling. Easy choice here with Patrick Cripps considered a rookie from a Fantasy perspective. He had an outstanding season which actually had him in the mix for the club MVP due to his remarkable consistency. He did not drop under 80 in the last seven rounds of the season and also showed an ability to go big throughout the season with impressive tallies of 128 and 137. If Patrick Cripps can continue to develop at this rate he could end his career as Fantasy royalty. If the Blues can start the season with a full strength midfield, it should free Cripps up for a few more uncontested possessions. Bryce Gibbs is coming off a season to forget after averaging just 81 from ten games. It was in fact his worst average since his rookie season where he managed 58. Given the fact he has averaged over 100 on three occasions including as high as 107 on two occasions he is possibly a bargain depending on how coach Bolton decides to use him. Can Dale Thomas return to a shadow of his former self? If so, he will be an absolute bargain after managing just five games for a career low average of just 57 this year. At his best, he has averaged as high as 103 in the past, but we will need to see some positive signs in the pre-season to even consider it. I might cop some grief here, but it has to be Brent Stanton. Not only does he deserve it for being the highest averaging/scoring Essendon player with 106.8 games from all 22 games, he had his best Fantasy season to date. Yes I might be a little silly calling for pig status to be award to him (it is just about getting Calvin worked up most of the time), but you can’t deny his scoring ability. 130 and 137 against Collingwood in their two games this year was pretty special. Stants should get Pig Status for that alone. Haha. As a coach of Brent Stanton, it is fitting to give him the coaches award. I picked him up after his bye for 113 and then a 58 much to the amusement of Calvin and Roy. From there it was six straight 100s and the only one under was a 94. Stants averaged 117.6 over the last nine rounds. Gun! This was hard to call. Nick O’Brien made the most coin with a $234K increase for an average 71 from 9 games. He came into the side in round 13 as a decent $120K midfield downgrade for the bench and threw up some decent scores including a 94 that may have been needed for some coaches in the Fantasy semi-final. Shaun McKernan was priced a little higher and but increased $216K. Surprisingly, S-Mac averaged 82 from his 9 games. These were boosted by the 130 v Gold Coast and the 115 v Collingwood in the Fantasy Semi and Grand Final respectively. The 49 against Goldy hurt a lot and was the reason why NOB gets the award for me. First up has to be Jobe Watson. The captain had a disappointing year dropping his average to 88.8 in another injury affected season. His best Fantasy average was 112.4 in 2012 and was coming off 104 last season which saw his price drop $145K for 2015. With a tough year behind him, a rejuvenated Watson could be a midfield bargain… possibly 20 points under-priced. The normally consistent Michael Hibberd delivered a 79.6 average this year from his 21 games. This down from the 87 and 98.3 he dished up with a very low standard deviation over the last two seasons. David Zaharakis is better than his 75 average and if he maintains FWD status, he should be considered. Alex Browne will also be a cheap defender in 2016 and worthy of a bench spot. Easy decision really… Jack Steven! He averaged 112 for the season, the most out of all the midfielders in the league. He played all 22 games and scored the most points out of everyone. Steven improved his average by 25pts from 2014 and has now stamped himself as one of the best premium midfielders in the game. Jack Newnes was one of the most selected defenders this year and many rode the ride from the start. He averaged 85 for the season, slightly better than 2014. Newnes ended up being a defender that many held thoughout the year and although he had his moments early in the season, he held strong to be ranked #8 from the original list of defenders from the start of the year. Although he averaged just 49, Jack Sinclair did rise $125,000 this year and played 18 games. He wore the dreaded vest 6 times and scored at an average of 60 when he didn’t. He’s one to watch next year now that this rubbish rule has been dropped. Honorable mention though must go to my man Jason Holmes. My boy from the USA played 3 games for an average of 44 and will only be better with every year in the system. But to be honest… slims pickings. The third year break-our rule applies to Jack Billings in 2016. Likened to the Stevie J of old, Billings averaged 84 this year from only 9 games. He should be discounted in price based on this and should be on your radar if he’s named as a forward next year. Sam Gilbert will be priced at his final average of 75 but did average 84 in his last 5 games. He just signed a new contract and did play lots of midfield time later in the year. Finally, lightly pencil him in… Paddy McCartin. He’ll be rookie priced (again) next year after 6 games with an average of 48. He’ll be under $250,00 you’d think and might be a solid bench option just like Mitch Clark was at the beginning of this year. Stefan Martin was the run-away winner of the MVP, managing 20 games and a league high average of 114.1 for the season. He was good all season but his best work when he was the sole ruck and this was clearly on display over the last six weeks where he never dropped under 107 and scored over 134 on four occasions making him an ideal option as a set and forget in 2016. Despite a horror run of serious injury that continued to threaten the output of the Fantasy Pig Tom Rockliff, he finished the season in familiar fashion, absolutely dominating the last six weeks of footy, never dropping below 123 and going over 140 on four occasions in that time. He averaged 104.7 for the season and 142.8 over the last five rounds which confirms him an automatic selection next year. It was slim pickings which hands the rookie of the year to a rookie priced player, who, in fact is a veteran in Luke McGuane. Despite only playing four games for the year, he was at the right time for coaches struggling to cover late season injuries and resting. His average of 57 caused a price rise of $93,000. After a slow start to the season, Mitch Robinson managed just one triple figure score in the first 13 weeks. From that point on, he absolutely dominated with seven scores over 100 in the last nine games. Of those tons, six were over 110, including a monster 166 against his former club. His season average was 91.1 and given his impressive finish, he will be under-priced going into 2016. After increasing his output to the elite level in 2014, Pearce Hanley lowered his output by almost ten points per game after returning from a serious injury to play 11 games. Keep an eye on his pre-season because if he is back to full fitness, he provides some value. I am going to put up my hand and say that I didn’t see Heath Shaw‘s season coming. He played all 22 games to average 96 which put him at the top of the list of points scored for the original Fantasy defenders and in second place behind Mundy who was added in round 6. Shaw also made the top 6 on average. From rounds 11 to 21, Shaw averaged 109.5 points but let a few jumping on board down in the last two rounds with a 74 and 77 in classic Heath Shaw style. Still, Shaw is definitely a worth MVP for the Giants starting at $456,000 and reaching a peak value of $568,000 in round 20. A bit of a funny one here for me but Tom Downie sat on my bench all year but got his first game in round 14 and smashed out seven games to increase $135K. If you needed a ruck in the preliminary final, his score of 93 would have done just fine! Other blokes close to the coaches award would be Adam Treloar who knocked out a $104 average or Callan Ward (100.4 average) but they’re boring picks for here. I did mention Downie, but Cam McCarthy has to be the rookie of the year. Starting at $136K, Sunshine played some great games off the Fantasy bench for many teams but most importantly got his price to $319,000 in round 10… a perfect time to cull him for some rookie cash. You would have to include Toby Greene on your watch list due to averaging 85 this year. Roy even had him in his top 8 midfielders last year. If Treloar is out the door, then he should benefit from more midfield time. Can he hold the FWD status he gained during the season? If so, lock him in up forward. Devon Smith is better than 86 and there is some upside in the Fantasy games of Stephen Coniglio and Lachlan Whitfield. Gaining DEF status due to his role off half back, Ryan Griffen will be a steal priced at 78.8. Fingers crossed he is still a DEF/MID.